The Dow closed up 67 points or 0.4% at 19,023 while the S&P rose 0.2% to 2202 and the Nasdaq gained 0.3%. Surging commodity prices were the major trigger but new all-time highs on Wall Street also seemed to spur investors into diving back into the Australian stock market as a whole yesterday, given no sector finished in the red in a 1.2% rally for the ASX200. Rotation of any sort was not apparent, although not every sector performed equally. Materials (up 2.8%) and energy (up 2.6%) led the charge on stronger base metal and oil prices, despite a weak overnight session for iron ore, and helped by little counter-movement in gold. Iron ore futures went the other way and traded “limit up” in the session, negating that offset. In contrast to trading over the past couple of months, the next best sector was utilities, up 2.1%. It has been typical in recent times for resources and other cyclicals to trade inversely to yield stocks and defensives. Yesterday was different; seemingly more of a case of buying anything that looked sufficiently cheap. Not joining the party were the banks and telcos, up only 0.3% each. Telstra ((TLS)) has been a volatile stock of late – not what you’d normally associate with a supposedly defensive telco. It seems talk of an NBN-related “earnings gap” ahead has investors thinking twice. And the lingering possibility of the banks having to raise new capital to meet new regulations, or at the least cut their dividends, may also have investors shying away from that sector. Yesterday’s rally was not a step-jump but a classic case of moving steadily upward as the day progressed. This suggests “real” buying. In sights was the technical level of 5400 for the index which was surpassed late morning, sparking some brief profit-taking, but once the rally resumed it fed on itself. If the index holds over 5400, chartists suggest then 5500 is in play. Donald Trump must be starting to think he’s a bit of a hero, if he didn’t already. The S&P500 has now posted a thirteen-day winning streak since Trump’s victory speech, to the tune of almost 3%. Nixon managed to spark a similar response, but Trump is still well behind Republican pin-up boy Ronny Ray Guns, whose election was worth over 8% in the same period. The Dow has closed over 19,000 for the first time in history. The S&P has closed over 2200 for the first time in history. The Nasdaq and Russell small cap indices also hit new all-time highs last night, marking the second consecutive session of all four doing so – a feat not seen since 1998. The thirteen-day day winning streak for the S&P is the first since 1996. Across Wall Street all talk is of just how far this rally can run on election promises (that are already being broken – “lock her up” is now off the table) which will take time to implement. Surely the honeymoon must fade at some point. Tonight in the US is all about trains, planes and automobiles. A mass exodus will begin from lunch time. A good day to take profits ahead of the Thanksgiving holiday? Recent volatility in bulks and base metal prices has had a lot to do with the Chinese government increasing margin requirements to curb rampant speculation, offsetting Trump euphoria. We’ve seen some sharp dips in iron ore and coal prices lately as a result. But is Beijing winning? Iron ore is up US$4.00 or 5.7% at US$73.80/t. Thermal coal is up 6.2%. There were some very big moves up for base metals on Monday night, with aluminium a smaller mover. Last night aluminium jumped 2% while copper, lead and nickel all added a further 1% and nickel fell 1%, having jumped over 5% in the prior session. West Texas crude has now rolled into the January delivery contract and last night it fell US17c to US$48.07/bbl after Monday night’s big move. The US dollar didn’t much come into play last night, ticking up less than 0.1% to 101.07. Gold is flat at US$1211.70/oz. The Aussie is up 0.5% at US$0.7399 despite the steady greenback, driven by commodity prices strength and, presumably, all this sudden talk of the next move in Australian interest rates being up. There are plenty of economists holding the opposite view. The SPI Overnight closed up 9 points. Locally we’ll see September quarter construction work done numbers today. Wall Street will see a big dump of data tonight, including the minutes of the November Fed meeting, before the evacuation begins. Programmed Maintenance ((PRG)) will release its earnings report today while the centres of attention in another round of AGMs will likely be Estia Health ((EHE)), following its torrid few months, and one of the most volatile stocks on the market at present, lithium producer Orocobre ((ORE)). Rudi will appear on Sky Business today, 12.30-2.30pm, instead of his usual Thursday appearance. The Dow closed up 88 points or 0.5% while the S&P gained 0.8% to 2198 and the Nasdaq rose 0.9%. It was a quiet session on the local bourse yesterday. Volume was weak as the ASX200 meandered its way in a minimal range to a soggy close. But again the lack of movement in the index belies what was going on underneath amongst the sectors. It would seem investors are simply not sure how they should be positioned going into year-end. I have highlighted in the previous couple of sessions that it appeared the long sell-off of yield stocks and defensives was finding a bottom and the abrupt run-up in resource stocks was tipping over. But yesterday, we went back the other way once more. On a tick-up in the oil price, energy was the best performer on the day with a 1.7% gain. It would seem traders were heartened by the WTI price rising back through the US$45/bbl mark on cautious confidence of an OPEC agreement being reached, rather than tanking down through 40. That buying will prove rather prescient today. Materials chimed in with a 0.3% gain but other than a flat day for the banks, all other sectors finished in the red. Notably, consumer staples and healthcare each fell 1.3%, telcos fell 0.9% and utilities fell 0.5%. The theme of the previous couple of sessions was reversed. Perhaps the seemingly relentless rise of US bond yields is just too much. The US bond yield stalled last night and the US dollar index dipped for the first time in several sessions. The door was opened for commodities to take centre stage. APEC meetings are not what we’d normally think of as market movers but aside from the attention being drawn by it being President Obama’s final outing, the attendance in Peru of Vladimir Putin and Xi Jinping has provided us with some headlines. The Russian president sees “a high probability” of an agreement being reached in Vienna on November 30, when OPEC tries to implement a production freeze. Russia will cooperate, Putin suggested, as a production freeze “is not an issue for us”. Those comments were worth 4.2% for the West Texas crude price, which rose US$1.92 to US$47.49/bbl. What is good for oil is seen as good for other commodities. Meanwhile, the Chinese president used his speech in Peru to confirm China’s support for a free trade area in the Asia-Pacific. The Chinese government is pushing for a Regional Comprehensive Economic Partnership of 16 countries. The now dead-in-the-water TPP was to involve 12 countries, including the big one, the US. We might presume China sees an opportunity to further step-up its global strength as the trade wall goes up around the United States. Free trade offers up the possibility of increased Chinese imports of raw materials, including lead, up 1% on the LME last night, aluminium and zinc, up 1.5%, copper, up 2.5%, and nickel, up 5%. Xi Jinping did not, however, manage to light a flame under the bulks, which few disagree have run too far, too fast. The thermal coal price was steady last night and iron ore plunged US$2.80 to US$69.80/t. The 0.3% dip in the US dollar index to 100.97 provided a green light for those commodities that did rally to do so, and also allowed gold to tick back US$3.30 to US$1211.90/oz. And the Aussie to tick back 0.3% to US$0.7361. The energy sector duly led Wall Street higher last night with materials trailing in its wake. But otherwise the positive mood was market-wide. The Dow, S&P and Nasdaq all simultaneously hit new all-time highs, for the first time since August. Back in August, US small caps were underperforming. Last night the Russell 2000 index also hit a new all-time high, marking a rare quadrella. What’s good for M&M Enterprises is good for the country. Except in this case Milo Minderbinder is Donald Trump and no one can yet identify the Catch-22. Outside of the commodity story there was no real new news to drive Wall Street higher last night. Only the dip in the greenback after a long run higher could be seen as any particular incentive. And the ten-year bond rate stalling. Donald Trump continues to interview prospective cabinet members but there has been no new news on that front either. Either way, US business television currently features commentator after commentator suggesting a Trump presidency cannot be anything other than positive for the stock market. They just can’t see any other scenario. The previous couple of sessions showed signs the Trump euphoria rally might be losing steam. Not so last night. Fresh all-time highs on Wall Street and surging commodity prices. How will this affect the Australian market today? Forget iron ore, the SPI Overnight has closed up 40 points or 0.8%. Earnings results are due out today from CYBG ((CYB)), Fisher & Paykel Healthcare ((FPH)) and Technology One ((TNE)). There is another round of AGMs to digest including another prominent Kiwi, The A2 Milk Company ((A2M)). Trump and US energy; coking coal's price surge; improved outlook for alumina, chrome and steel; positive trends for Oz miners. In assessing what a Donald Trump presidency and Republican-controlled Congress may mean for the US energy complex in coming years, researchers at Raymond James suspect the "attack dogs" that have waged war on the US oil and gas industry over the past years will be called off. This includes the Environmental Protection Agency, the Endangered Species Act, and numerous executive orders that have catered to the US environmental lobby. Longer term, more access to federal lands and less government regulation should mean lower US energy costs. If these policies survive the next decade, the researchers expect the US to have the lowest energy costs in the world. Yet there are variables that influence short-term oil prices and who sits in the Oval Office, or controls Congress, is not one of them. Given that one of Trump's hallmark issues is the Iranian nuclear deal there is the possibility that Iran's oil supply could be interrupted by a revival of US sanctions. That said, Raymond James observes this agreement was a multi-country arrangement and it may not matter if the US backs out. The sanction that impacted Iran the most was the European Union's oil embargo. The researchers note Trump's deregulation agenda may prove to be a gusher for energy and petroleum companies. The possibility of a federal anti-fracking legislation is less likely and there are also other benefits that would trickle down from the relief of regulatory pressure on pipeline construction. Oilfield services also stand to benefit from more drilling activity. The lower cost of production means that the market share gains in the US should increase versus the rest of the world as relative returns improve, and activity gains in the US are also likely to outpace those in offshore arenas. For the refiners a much more favourable regulatory environment is likely to emerge but quantifying this is difficult, the researchers assert. Yet a return to substantial US oil and gas production growth over the medium term is likely to further cement the structural advantages of the US refining system. In terms of coal, its market share in the electricity mix has fallen to 33% in 2015 from 50% in 2005. Coal will see some relief from the lack of a federal de-carbonisation mandate, but Raymond James still expects coal to continue to lose share. Cheap natural gas from fracking and increasingly cheaper wind and solar are expected to be too powerful for coal to go back to where it was a decade ago. In sum, the researchers believe the winners from Trump policies are the US economy, US consumers, US oil & gas companies, US oilfield services, US mid-stream companies, US coal, and US renewable power. Chinese policies on coal have prompted a significant surge in import demand at a time when the major exporters have been reluctant or unable to respond, resulting in a price spike. As a result, ANZ analysts upgrade coking (metallurgical) coal forecasts. The analyst expect contract prices to average US$178/t in 2017 and US$135/t in 2018. Higher spot prices are expected to induce a global supply response, led by North America, but not until there is some sustainability in prices. The analysts do not expect this to occur until the second half of 2017 and do not envisage major exporters raising output immediately. Australian producers are already at capacity and are now being hampered by wet weather. Chinese coking coal production is also expected to decline over the next two years and recent strength in steel production is unlikely to continue, which should help alleviate the tightness in coming years. The analysts suggest upgraded coking coal price forecasts have implications for the broader Australian economy. Their estimate of Australia's terms of trade is improved by 3% with a resulting small lift in nominal GDP. India is expected to drive long-term demand for coking coal, with its government aiming to triple steel production by 2025. India's focus on infrastructure investment should underpin greater demand for coal imports for the remainder of 2016 and for 2017. Yet, the analysts observe a large fiscal deficit has restricted investment by the Indian government, while complicated project approval processes and land acquisition issues have made completing large-scale steel projects difficult. As a result, they envisage only mild growth for Indian coking coal imports, rising to around 55mt by 2020, and accelerating more quickly after that. Australian metallurgical coal producers are likely to be the greatest beneficiaries of higher imports by India, with Australia supplying around 85% of that country's total import requirements. Macquarie notes three commodities for which the price outlook in 2017 has improved markedly. The broker raises forecasts for alumina, ferrochrome and steel, upgrading alumina price estimates by 27% for 2017, ferrochrome contract prices by 33%, and steel prices an average of 17% for the next three quarters. The broker has become more confident in the upside case for alumina as Chinese aluminium smelter re-starts are finally under way and this is resulting in accelerating growth in demand after a stagnant 2016. Meanwhile, Chinese alumina production re-starts are not keeping pace, hindered by environmental inspections and a shortage of caustic soda. The issues may be transient but the broker still expects a Chinese market deficit in 2017 and 2018, a gap which will have to be filled by the international market. The broker reiterates its observation that significant ex-China supply is still coming to the market. Macquarie notes rises in chrome ore pricing over October were most dramatic. Chrome is a clear raw material constraint in a market that relies heavily on South Africa for global supply and where China has no substantial domestic resource. As stainless steel output continues to look strong in China, and growth in Indonesia is ramping up, tightness in the chrome market appears set to persist. With no chance of direct substitution in stainless steel, Macquarie is looking at an ever tighter chrome market in 2017 and beyond. The broker notes steel makers are doing their best to offset the recent surge in raw material prices. Steel prices so far have not encompassed a full passing through of the cost push that has been exerted. Steel margins, therefore, remain under pressure, both in China and globally. While the expectation of strong infrastructure expenditure offers some hope for demand, the scale of over capacity in the steel industry signals to Macquarie that a sustained margin recovery will be difficult to achieve. Macquarie retains a positive stance on most of the bulk commodity producers. The broker envisages material upside to base case forecasts for coking coal, manganese, iron ore and thermal coal. Incorporating updated commodity price and exchange rate forecasts has translated into solid upgrades to earnings estimates for South 32 ((S32)), and Alumina Ltd ((AWC)) - upgraded to Neutral from Underperform - but more modest updates for most other stocks. Marking to market the broker upgrades its iron ore price expectations for the December quarter, which leads to upgrades to FY17 forecasts for BHP Billiton ((BHP)), Fortescue Metals ((FMG)) and Mount Gibson ((MGX)), and to the 2016 forecasts for Rio Tinto ((RIO)). Credit Suisse expects that commodity prices, led by coal, are unlikely to stay at current levels yet they may be materially higher than its current base-case forecasts suggest. This could have the effect of re-setting balance sheets and re-invigorating investor demand for capital management. The broker is yet to revise its base case forecasts but envisages a rapid de-gearing in balance sheets and strong uplift to earnings. While South 32 is already under-geared, the broker envisages Rio Tinto, Whitehaven Coal ((WHC)) and BHP could all move to an under-geared position by the end of FY18. What Does Hazelwood Closure Mean For AGL? French owner ENGIE has announced Victoria's Hazelwood power station will close in March and higher wholesale electricity prices are expected as a result. French owner ENGIE will close Victoria's Hazelwood power station and associated brown coal mine in March 2017. This is consistent with the company's strategy to exit coal activities. Hazelwood recently supplied around 20% of Victoria's electricity generation. As a result, the upcoming closure is expected to substantially tighten the supply/demand balance in the wholesale electricity market in Victoria from 2017, and make prices more volatile and higher on average. What does this herald for AGL Energy ((AGL)), Victoria's largest base load power station operator? With substantial upside risks to wholesale electricity prices AGL would be the main beneficiary, as it is highly leveraged to Victorian wholesale electricity prices because of its ownership of the Loy Yang A coal-fired power station. Deutsche Bank calculates that every $15/MWh move in the Victorian wholesale electricity curve represents around $150m of incremental net profit for AGL, once legacy hedges have rolled off. Brokers also believe the closure of Alcoa's Portland aluminium smelter is now probable, given the associated change in the Victorian wholesale electricity forward curve from the exit of Hazelwood. Given its high consumption of electricity closure of Portland would help mitigate the tightness in the Victorian wholesale electricity market. Macquarie believes scope exists for the simultaneous closure of Hazelwood and Portland. This would bring stability and balance to the Victorian base load market. AGL is the biggest winner in this scenario. The broker expects there to be some negative response to the Hazelwood closure and subsequent price rises, in terms of demand, which is likely to be more prominent at the retail level. Yet broadly the fundamentals are unchanged, as forward curves continue to signal a strong, and now more balanced, wholesale base load market. The uplift to AGL earnings should underpin continued cash generation from re-pricing across the company's books, in the broker's view. Citi upgraded earnings estimates for AGL substantially back in September, when the closure of Hazelwood loomed likely. The broker suspects higher electricity prices may start to be incorporated in consensus estimates but the near-term prospect of Portland's closure, and Loy Yang industrial action, may mean that upgrades are slower to eventuate. AGL's share price has recently disconnected from wholesale electricity prices, which the broker attributes to the company's conservative commentary at the FY16 result. Citi envisages material upside to the share price as investors regain confidence in the earnings outlook. The broker notes reduced flexibility in gas markets also limits the ability to cheaply support peak electricity demand, and with ENGIE leaving the market it reduces the liquidity in electricity contract markets, creating price pressure for non-integrated retailers. The broker agrees the closure of Hazelwood is constructive for AGL as electricity prices are the company's biggest driver of earnings, and this more than offsets the risks from closing Portland. On the subject of Portland, Citi believes closure is very likely and already factored into wholesale prices. The size of the subsidy required to keep it open would make it incredibly difficult for the Victorian government to justify protecting an estimated 500 jobs and 200 contractors. At Loy Yang A, AGL is currently negotiating with the union on a new enterprise bargaining agreement. Citi also suspects that the closure of Hazelwood will provide an opportunity for coal generation in NSW and Queensland to run harder where spare capacity exists. Origin Energy's ((ORG)) Eraring power station in NSW has the greatest potential to increase generation above its current capacity of 50-60%, because of its location close to the Newcastle coal export terminal. AGL's MacGen in NSW is already at close to its age-limited capacity and Mt Piper is limited because of its inland location. The broker highlights the fact that the age of the Australian coal-generated power station fleet limits the ability to run them consistently at maximum production without risking breakage. Outside of Hazelwood (50 years old) and Liddell (NSW) (40 years old), the broker surmises that a further seven power stations that are over 30 years old are less likely to close for now. The wild card in the mix is any government carbon/renewable policy changes, which further incentivise renewables and accelerate coal closures. Further to speculation regarding other power station closures, Ord Minnett suggests old power stations in Victoria, such as Yallourn, could be targeted next by activists. ENGIE will appoint an advisor for the sale of its 1,000MW brown coal-fired Loy Yang B and the 123MW gas-fired Kwinana co-generation operation in Western Australia. The broker finds it hard to envisage a local buyer for Loy Yang B, as competition obstacles are likely to rule out AGL and Energy Australia and a focus on de-leveraging rules out Origin. Being mindful that two brokers are yet to update on the implications of the Hazelwood closure, FNArena's database has five Buy ratings and one Sell (Morgan Stanley) for AGL. The consensus target is $21.18, suggesting 8.3% upside to the last share price. This compares with $20.22 ahead of the announcement. Targets range from $18.80 (Morgan Stanley) to $23.00 (Ord Minnett). The fundamental data surrounding the price of Crude Oil [WTI] continues to put doubt in the upward direction of Crude Oil. On Wednesday, the EIA Crude data confirmed what many traders had feared. Namely, the rise in the price of Oil would cause the production from active rigs in still-profitable shale regions to aggressively turn on the spigots to help service liabilities. The expectation ahead of the 10:30 am ET release was ~2M Barrels, and API data had forecasted ~9M barrels. Therefore, the 14M build in U.S. inventories caused a sharp sell-off in Oil taking the price lower by nearly 3.5% after the report. After the data released and the continuation of the market beginning to price in the failure of an OPEC deal to cut production is feeling like a crash after trading at 15-month highs. We shared yesterday how the relative number of bulls as seen in the recent CoT report that shows the difference between net speculative positioning and net commercial positioning measured is at 98% of the 52-week percentile, and US dollar is at 100% of the 52-week percentile. This relative extreme doesn’t imply a top but can be indicative that there could be a significant unwind if disappointing data emerges such as a failed OPEC deal. As the picture comes together, you can see the reasons for the sell-off in Crude Oil. Despite the soft promise from OPEC to making progress to an accord, nearly everyone in OPEC is increasing production while Rosneft, the oil company owned by the Government of Russia, is bragging about excess capacity and U.S inventory rises by the largest amount on record. There is the bright side of U.S. & China demand, but the supply glut issue remains as prevalent as ever. Crude Oil has retraced below the 61.8% of its rally from mid-September that started at [US]$42.72/bbl and went as high as $51.92/bbl in mid-October into the Ichimoku Cloud. The next, and some would argue last-Fibonacci worth watching is the 78.6% retracement that sits at $41.71/bbl. Now that we’ve broken below the Trendline shown above, it’s fair to think we could see a further unwind of the relative extreme on a 52-week basis in the CoT differential index. Because the price has broken below this zone of support that is comprised of the Trendline drawn from February and now sits in the Ichimoku cloud, we will likely see a much deeper correction as confidence is broken. 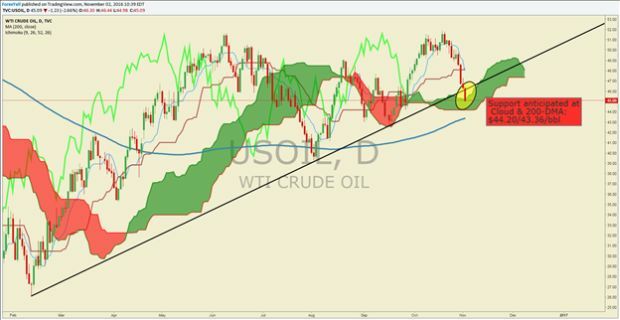 The next downside levels to watch are the 78.6% retracement followed by the base of the Ichimoku cloud at $44.13/bbl, and lastly the September low at $42.72/bbl. Due to the stretched relative positioning, as explained in the CoT note, we could see a further breakdown of these technical support points that may provide a wave of selling pressure that drops price closer to $40/bbl. Given the ~13% drop in ten days, a bounce is expected now that we’re trading within the Ichimoku Cloud. However, another break below the Cloud could, in fact, have this move pinned from August to October as a double top pattern, which would be validated on a close below $39.15%. The resistance level that we’ll be watching from here is the current November opening range high at $47.34/bbl followed by $49/bbl. Until the break of resistance surfaces, we’ll be anticipating any move higher to unfold in three waves in a corrective fashion that resumes lower. The burden of proof is now on the Bulls, and we’ll continue to doubt their arguments if the price of Oil to fails surpass $47.34-49/bbl before anticipating new 15-month highs anytime soon. Reprinted with permission of the publisher. The above story can be read on the website www.dailyfx.com here. The views expressed are not by association FNArena's (see our disclaimer). Forex Capital Markets is headquartered at Financial Square 32 Old Slip, 10th Floor, New York, NY 10005 USA. Trading foreign exchange on margin carries a high level of risk, and may not be suitable for all investors. The high degree of leverage can work against you as well as for you. Before you decide to trade the foreign exchange products offered by Forex Capital Markets, LLC, Forex Capital Markets Limited, inclusive of all EU branches, FXCM Asia Limited, or FXCM Australia Limited, any affiliates of aforementioned firms, or other firms under the FXCM group of companies [collectively “FXCM Group”] you should carefully consider your objectives, financial situation, needs and level of experience. If you decide to trade foreign exchange products offered by FXCM Australia Limited you must read and understand the Financial Services Guide and the Product Disclosure Statement. FXCM Group may provide general market information and commentary which is not intended to be investment advice and the content of this email must not be construed as personal advice. By trading, you could sustain a total loss of your deposited funds and therefore, you should not speculate with capital that you cannot afford to lose. You should be aware of all the risks associated with trading in foreign exchange products. Foreign exchange products are only suitable for those customers who fully understand the market risk. FXCM recommends you seek advice from a separate financial advisor. The Dow closed down 29 points or 0.2% while the S&P lost 0.3% to 2133 and the Nasdaq fell 0.7%. It seemed as if we had found a bottom in the ASX200 at 5350 technical support yesterday as the index spent the morning holding its ground, following Wednesday’s surprisingly severe sell-off. But 5350 prove only a pivot point as there seemed no great desire to drive a rebound. And sure enough, another wave of selling hit at midday, and down we went again. Reports suggest the selling has been futures-led, implying a large fund manager or fund managers have decided to “Sell Australia”. It only takes a small reallocation of a giant global portfolio to send little old Australia spiralling. The quickest way to achieve a wholesale “Sell Australia” is to first sell the SPI futures on the ASX200. This locks in the exit, and fund managers can at a later date, when the dust settles, sell actual stock positions and buy back the futures at a lower level. When the futures are sold, those on the buy-side have the unenviable task of trying to cover by selling stocks into a falling market. And it is unenviable at present because the local market is in a panicky mood anyway, sparked by a run of bad news coming out of AGMs and other matters. We can see the market-wide confirmation in the fact all sectors, bar one, fell in unison yesterday and the hardest hit were those where the large caps mostly reside. The top 20 will give you about an 80% or more replication of the whole 200 in market cap terms. Only info tech finished in the green, dominated by Computershare ((CPU)) which is being supported by rising US rates. There were only a couple of notable up-movers bucking the trend otherwise – one being Ardent Leisure ((AAD)), which saw some bargain hunting despite a rather poor AGM performance. Challenger ((CGF)) has gone from strength to strength lately on the popularity of annuities, and it jumped another 4% after its AGM. On the other side of the ledger, the biggest percentage moves down were reserved for resource sector stocks. Outside of an 11% drop for APN News & Media ((APN)) on capital raising dilution, eight of the other nine top ten down-movers were miners – the same miners who have been enjoying stellar runs lately on improved commodity prices (eg South32, Whitehaven) or futuristic over-exuberance (eg Orocobre, Syrah). Clearly those investors having dined out lately on the outperformance of their mining-weighted portfolios were in a desperate race to lock in profits yesterday before the sky fell in. The other big news was of course National Bank’s ((NAB)) decision not to cut its dividend, yet. NAB thus managed to fight back against solid bank selling. US monthly data flow of late has been fair to reasonable, positive but not shooting the lights out. Either way, not bad enough for the market to assume the Fed won’t hike in December. Tonight sees the more substantive first estimate of September quarter GDP, so any shock there might change the mood. But these days both the Atlanta and NY Feds publish continuous GDP run rates, thus expectations of around 2.5% growth have fairly solid evidence behind them. As we move closer to December, the US ten-year yield is again starting to tick up. Last night it rose 5 basis points to 1.84%. We recall that 1.85% was the pre-Brexit vote high, hence traders assume that a break of 1.85% could mean a rush back to 2%. And it’s not just US Treasuries. Bunds, gilts, JGBs and others are all quietly on the move. It’s not good news for bond-proxy stocks, hence an early one hundred point fall in the Dow last night was largely driven by telcos, utilities, REITs and the like. Yet as we have seen so often in past sessions, the early drop was met by a choppy recovery. Choppiness can be put down to individual earnings results, which continue to be mixed but net positive, while fourth quarter guidance remains an area of concern. Among the Dow stocks, last night saw a miss from Ford and a 1% drop and a miss from Colgate-Palmolive and a 1% drop, while outside the Dow, ConocoPhillips was a winner and jumped 5%. This morning’s major after-the-bell reports see Amazon down 5% and Dow component Alphabet (Google) up 1%. The other big market influence at present is of course oil, and it found some support last night after Saudi Arabia actually came out with a number – a 4% production cut from those who can cop it. While the official meeting is not until the end of November, this weekend sees another gathering to further nut out possibilities. Could it be that this time there really is a wolf? West Texas crude is up US49c at US$49.60/bbl. Base metal prices all rose around about 1%, except lead, which rose modestly. Iron ore finally retreated, down US40c to US$62.30/oz. The US dollar index is up 0.3% at 98.91 and gold is relatively steady at US$1269.00/oz. The Aussie is down 0.7% at US$0.7588. This may give weight to the assumption stock market selling is coming from offshore. The SPI Overnight is rather boldly up 28 points or 0.5%. This would suggest that maybe the selling has now been completed, or at least the market hopes it has. There should be some bargains on offer. Locally we see the September quarter PPI and September new homes sales numbers today. Tonight the US GDP will be in focus. Woolworths ((WOW)) will report September quarter sales today. Having seen what happened to its rival, they would want to be good. Macquarie Group ((MQG)) releases first half earnings. And there’s another handful of AGMs. Rudi will connect with Sky Business today, via Skype, to discuss broker calls for about ten minutes, starting around 11.05am. The Dow closed up 30 points or 0.2% while the S&P fell 0.2% to 2139 as the Nasdaq fell 0.6%. For a month the ASX200 has been up and down in a range of 5400-5500, meeting bargain hunters at the bottom and profit-takers at the top. The topside has looked the least likely to be penetrated given uncertainty surrounding upcoming, very influential global events. Which leaves us with the downside. We saw a bit of a hint of it on Monday, but on Tuesday the bargain hunters reappeared. They also reappeared yesterday when the index dropped immediately to 5400 on the open. They hung on for almost an hour but it was to no avail. There was just too much bad news about. Yesterday’s bellwether trigger was Wesfarmers ((WES)), or more specifically Coles. Looks like the honeymoon’s finally over. Stoic investors have continued to back the big supermarkets because...well…of tradition mostly. Wesfarmers does not traditionally fall 6% but it did yesterday. Then there’s the tragedy of Ardent Leisure ((AAD)), down another 15%, an ongoing exit from stocks reliant on the Chinese consumer, following Tuesday’s Bega Cheese ((BGA)) scare, and the other China story – Crown Resorts ((CWN)). And we have Healthscope ((HSO)). Having been sucked down in the vortex, peer Ramsay Health Care ((RHC)) issued the briefest of statements yesterday to allay fears of any similar problems. Ramsay shares managed only a very modest bounce after a solid fall. When the levy broke at 5400 it was on for young and old – market-wide. Tuesday night saw a big jump in the iron ore price, solid moves up in base metals and a bit of a rebound for gold, yet the materials sector closed down 0.7% yesterday. It was at least an “outperformance”. The banks that had been bought up this week on the dividend play were dumped, down 1.3%, ahead of National Bank’s ((NAB)) earnings report today. The big loser on the day was consumer staples, down 3.3% thanks to Wesfarmers, but consumer discretionary wasn’t far behind with a 2.5% fall. This sector is very much influenced by monetary policy, but it appears yesterday’s CPI release had little impact on a market already hell bent on heading south. The media will always focus on the headline inflation rate, and it was up 0.7% in the September quarter for an annual rate of 1.3% when 0.5% and 1.1% were forecast. There goes your RBA rate hike, is the conclusion. But the core rate rose only 0.3% when 0.4% was expected for an annual 1.5% against 1.7% expectation. The RBA focuses on the core rate, ex food & energy. Thus we can say inflation was actually weaker than expected. But not as weak as it was back in the March quarter, which prompted the last rate cut. So will we see a Cup Day cut next week? CBA’s economists say yes, but with less conviction. St George says yes, but it’s a “line ball call”. ANZ believes the data increases the odds of a cut – next year. Others say no cut on Tuesday. Place your bets. The immediate reaction in forex markets was no cut, given the Aussie jumped straight to 77, but then traders read further down the document, past the headline result, and by late evening the Aussie was back where it started. It is this morning unchanged over 24 hours at US$0.7643. Did we see the shake-out in the stock market yesterday that we needed to see? The index held 5350, which is also an important technical level. Certainly some of the high-flying names for which analysts have been calling valuations overstretched have come back to earth somewhat. Buying opportunity? Well we’ll probably have to get past Trump, OPEC and the Fed first. Santa is watching closely. The Dow was down a hundred points from the open last night and then up 70 points before midday. The major underlying driver was oil. US oil forecasting is a JOKE. Yesterday I noted weekly inventory forecasts are never right and in the past I’ve pointed out how numbers from the American Petroleum Institute and numbers from the Energy Information Agency are so often wildly different. Before the open on Wall Street last night, the API had predicted a weekly crude inventory build. The market was expecting a build, but not by as much. Already looking nervous under US$50, particularly with the whole production freeze issue looking decidedly shaky, WTI plunged to below US$49/bbl from the open on Nymex. Then the EIA report came out indicating a small drawdown, and WTI shot back up over US$50. Hence we saw the Dow down a hundred and then up 70. The oil price drifted back towards the close to be down US67c over 24 hours at US$49.15/bbl. The Dow closed up 30. Outside of oil, we saw a weak result from Apple in Tuesday night’s aftermarket, mostly guidance related, send apple shares down over 2%. On the other hand, Boeing posted a very strong result which saw its shares up almost 5%. Both are Dow stocks, but only Apple is a Nasdaq stock. That’s why the Dow closed up 0.2% last night and the Nasdaq closed down 0.6%. Some 40% of S&P500 companies have reported to date and the run-rate is 2.5% earnings growth. That should be good news, given a 2% fall had been predicted. And revenues are up 2.8%, which is very positive. Yet Wall Street is failing to respond in a positive fashion. One reason is aforementioned uncertainty with regard upcoming events. The other is disappointing December quarter guidance, despite strong September earnings results. But then a lot of that has been put down to uncertainty in the quarter, given upcoming events. After their strong session on Tuesday night, last night saw base metals moves return to being mixed and minimal. Zinc fell 1%. Iron ore has kicked on, rising another US$1.10 to US$62.70/t. Tuesday night’s gold rally proved fleeting as gold is down US$7.20 at US$1266.70/oz, despite the US dollar index slipping 0.1% to 98.63. The SPI Overnight closed up 8 points. Not quite the stuff of rebounds after a day of carnage, but then Wall Street has not provided much impetus. In a case of unfortunate timing, Ardent Leisure ((AAD)) will host is AGM today. Indeed it’s a very busy day on the AGM calendar. But the greatest focus will be on NAB’s earnings result. And more specifically, its dividend. NAB did not cut, yet (?). Rudi will appear on Sky Business, 12.20-2.30pm. The Dow closed down 53 points or 0.3% while the S&P lost 0.4% to 2143 and the Nasdaq fell 0.5%. The AGM season claimed another victim on the local market yesterday. Bega Cheese ((BGA)) shares fell 17%. Clearly the company was wrong in believing the Chinese market is insatiable. Not content to continuing selling just its well-known cheese products, Bega had decided to hook up with Blackmores ((BKL)), which clearly was not content to only sell dietary supplements. The two took on the Chinese infant formula market, where already there are a crowd of A&NZ milk companies operating, and found it oversupplied. The other big loser on the day is a tragic story. Ardent Leisure ((AAD)) fell 8% very late in the session so there may be more to come. Otherwise, having surprised all and sundry by falling so heavily on Monday, the ASX200 again defied overnight futures trading in jumping back up 47 on the open before settling up 34. It was more of a step-jump than a rally, which again prompts the question what on earth was going on on Monday. The banks clearly led the market up yesterday in what is a traditional seasonal pattern. The 0.8% sector gain reflects the fact there are three juicy dividends on offer (albeit maybe less than in previous years), and you need to get in now if you want a piece of the action. Then you sell in December and switch into CBA on the different cycle. All sectors finished in the green yesterday bar consumer staples, thanks to Bega and friends, and energy, which dipped slightly on lower oil. Having reset, the market will now look ahead to today’s September quarter CPI number, which will set the agenda for RBA policy and determine whether the Aussie goes higher or lower. Economists are looking for 0.5% headline growth for 1.1% year on year, and 0.4% core growth for 1.7% year on year. Russia is now apparently wavering on a production freeze agreement with OPEC. The WTI price thus slipped under US$50/bbl last night which was one source of weakness on Wall Street. US consumer confidence has fallen to its lowest level since May, according to the Conference Board monthly measure. It’s not great news for retailers with the Thanksgiving shopping spree now only a month away. But it is typical of confidence to dip going into a presidential election, and the bizarre offering this time around is more reason to be cautious. The main reason Wall Street was lower last night centred around earnings season. It is not third quarter earnings that are the issue, as they continue to point to the first positive result for the S&P500 in six quarters. It is fourth quarter guidance which, given all the uncertainty in the world at this time, has been disappointing in many cases. Among the Dow stocks, consumer staple stalwart Proctor & Gamble has been a popular stock to hide one’s money in this year and it did not disappoint, rising 3%. But despite posting positive results, all of 3M, DuPont and Home Depot shares fell on underwhelming guidance. Outside the Dow, Whirlpool went down one, falling 11% on weak, Brexit-impacted UK sales. General Motors suffered the same fate, and fell 4%. High flyer Under Armour fell 13% and had Wall Street wondering whether the “athleisure” bubble has now burst. Add it all up and the Dow fell 50 points. On Monday night it rallied 70 points. With PEs looking stretched and December quarter earnings guidance failing to provide support, the upside currently appears limited. With funds managers lined up to swoop on any weakness so they can put money to work on a TINA basis, the downside appears limited. As Gerry Rafferty would put it, here I am, stuck in the middle with you. Forecasts this week are for a build in US crude inventories following a couple of weeks of surprise drawdowns. Throw in doubt over Russia and West Texas crude is down US81c at US$49.82/bbl. Between environmental shutdowns forced by the governments of China and the Philippines, and economy-based restrictions in Indonesia, the supply of bulks and base metals is expected to be constrained going forward. Yet there appears no constraint on Chinese demand, which is on the rise. Last night lead and nickel rose over 1% and aluminium, copper and zinc rose over 2%. Iron ore has jumped up US$2.90 or 5% to US$61.60/t. We are entering one of the two holiday periods in which Indians typically exchange gifts of gold. Outside of monetary policy influences, such demand from India can be a real mover of the dial for the gold price. Last night gold rose US$9.40 to US$1273.40/oz. The rally in gold, and indeed other commodities, may also lend itself to creeping belief the recent run-up in the US dollar has come to an end for now. The greenback has adjusted to the expectation of a December Fed rate hike and now must wait for confirmation. The dollar index has been flat for a few sessions in a row now, which suggests it might just be ready to tip over. It is little changed this morning at 98.73. On commodity price strength, the Aussie is up 0.4% at US$0.7641. The SPI Overnight closed down 12 points or 0.2%. Seems strange in the face of commodity price strength but the SPI’s been no sort of indicator these last few sessions. The local CPI result is due late morning. There’s another round of AGMs today and quarterly earnings results are due from Alacer Gold ((AQG)) and ResMed ((RMD)) and quarterly production numbers from Independence Group ((IGO)). Wesfarmers ((WES)) will report quarterly sales figures. While Coles will be in focus as always, don’t forget Wesfarmers also produces coal. Rudi will gear up in the afternoon to host Your Money, Your Call on Sky Business tonight, 8-9.30pm. Commodity demand rebound; crude challenges; thermal coal exports; blast furnace efficiencies; alumina price surge; nickel ore exports. RBC Capital Markets observes Chinese economic stimulus and a rebound in demand for steel production have underpinned a broad recovery in commodity prices. Specifically for zinc, permanent mine closures related to an exhausting of reserves have tightened that market and driven prices higher. A similar situation relates to coal production cuts in China that have caused coal prices to spiral higher. The analysis suggests the zinc market still has the best fundamentals and remains the top pick. Based on 2016 price forecasts, RBC Capital Markets analysts prefer zinc, coking coal and palladium. Based on five-year forecasts the analysts prefer nickel, zinc, uranium and copper. The analysts believe, in the absence of further production cuts, stronger economic growth and demand are required to balance most commodity markets and lead to a sustained rally in prices. With the exception of coal and uranium, the analysts make minor changes to forecasts. Average coking (metallurgical) coal price forecasts are increased 37% and thermal coal are increased 17%. The analysts' average uranium price forecast is lowered 24%. The analysts recommend investors increase exposure to non-precious metal mining shares. The trend in US inventories is looking better for crude but Morgan Stanley observes signs of physical market stress. The broker contends recent inventory data is backward-looking and exports are more important than production as a signal for physical markets. The main challenge is that Atlantic Basin loadings are recovering. While the backlog should clear with appropriate price signals an oversupply risk persists. The headline rig count may be understating upcoming US supply and the broker also believes the disruptive nature of US shale oil is underappreciated. Moreover, while some are becoming excited about the longer-term bullish comments from Saudi Arabia, Morgan Stanley points to a large number of producers that are increasingly finding ways to survive in a US$50-60/bbl world. ANZ analysts suggest exporters of thermal coal are struggling to react to the shifting dynamics in the seaborne market. With China's new-found reliance on the international market, import demand in the Asian region has surged in recent months. Despite efforts to limit the impact of capacity closures on utilities in China, the analysts expect import demand to remain strong. Japanese buyers have also played a part in the current price rally. A move to more spot purchases occurred just as Chinese imports surged and has caught some consumers short. Prices may be making almost every producer positive in terms of cash flow but the analysts believe an immediate supply response is likely to be muted and prices are likely to continue being dictated by China’s policy measures. If coal output can be temporarily raised heading into the northern hemisphere winter, prices may ease over the next couple of months. Even so, spot prices are expected to remain above US$80/t over the winter. When coking coal prices surge, steelmakers try to adapt, and Macquarie observes a standard tactic is to maximise blast furnace efficiency. This can lead to increased use of iron ore pellets. At US$35/t, pellet premiums are now at the highest level since 2014. At every time coking coal prices surged in 2005, 2008 and 2011 this was met with gains in pellet premiums. With Samarco still off-line for the foreseeable future and limited growth from other suppliers, further upside to pellet prices seems probable to Macquarie. At present, the broker considers it unlikely Vale will re-start pellet capacity unless the pellet premium rises a further US$10/t. However, prices above US$45/t are considered unlikely. As the global steel industry settles into a very low, or negative, growth pattern, operational gains will prove a strong differentiator, in the broker's opinion. In developed economies, and perhaps even China, this is likely to be augmented by the stricter environmental constraints placed on sinter plants and, hence, lead to closures of some operations. Alumina's spot price is up over 30% in the year to date, to almost US$280/t CFR China, but Morgan Stanley believes one cannot assume downstream metal production and demand growth is strong. Aluminium's global market is on track to expand just 1.3-1.9% in 2016, the smallest lift since the GFC. Floods, industry reforms and reactivating of smelters are forcing a lift in China's alumina imports. Morgan Stanley estimates total alumina supply affected in 2016 by these events exceeds 10mt or 8-9% of global supply. Yet upside to the now-buoyant spot price is likely to be limited by the responses by refineries elsewhere. Morgan Stanley believes the recent reactivation of China's smelting capacity is alumina's sole short-term driver of demand. Slower northern winter trade will probably moderate price performance too. The latest decision by the Indonesia government not to allow nickel ore exports to resume puts the attention back on the Philippines. Widespread mine closures are not expected in 2017 but Macquarie suggests extreme tightness is still likely to emerge for nickel ore supply in China and nickel prices could spike early in 2017. As ore prices rise, the cost of making nickel pig iron (NPI) will also rise, while other NPI cost inputs are also rising strongly (coal and coke). The broker estimates that the break-even level for Chinese NPI producers is already close to US$10,000/t, and in early 2017 could well rise above US$11,000/t as ore and carbon prices rise. Macquarie expects Indonesian nickel pig iron production to grow from 28kt last year to 98kt this year and then to 170–180kt next year. Demand, meanwhile, has risen strongly, driven by a sharp rise in Chinese stainless steel production, especially for high-grade nickel (8%) 300 series. Macquarie's latest supply/demand balance estimates shows a deficit of 70,000t this year and 100,000t next year, even with the expected rise in combined nickel pig iron production in Indonesia and China. Prices could easily move into the US$11,000–12,000/t range in the March quarter as nickel ore stocks fall to extremely low levels, the broker believes. Any major disruption to supplies from the Philippines would add to the higher price outlook. Macquarie would be a buyer into any price dips below US$10,000/t.